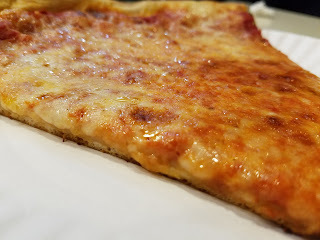 Over the years, I have struggled to find great "mall pizza" because it's usually pretty cookie-cutter stuff that has your standard thin crust, a semi-sweet sauce, and a salty cheese all packed on a par-baked pizza that has been sitting on the counter ready for you to select for the counter person to stick back in the oven for reheating. If done properly with fresh pizzas, quality ingredients, and a thorough reheat, this method can produce some very tasty and crispy results that really satisfy. Check out Rosario's, Armenti's, and Basilico's, who are the masters of these methods. I have received some scattered suggestions to give "The Good Dino's" in the Wyoming Valley Mall a try over the past few years and I was finally in town so I decided to swing in for a quick stop. 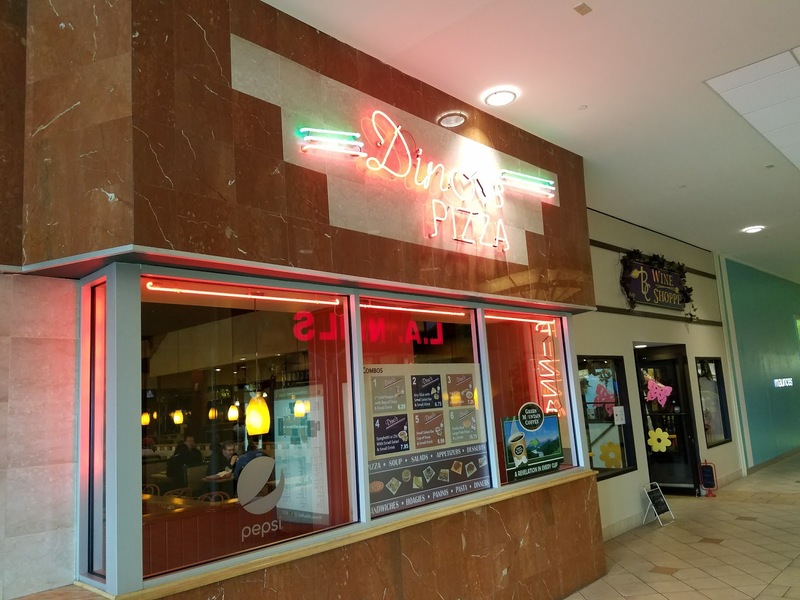 If you aren't up to speed on pizza in the WV Mall, there are actually 2 pizzerias named Dino's, owned by different people. I reviewed the Dino's in the food court several years ago with subpar results, so I was hoping the other Dino's (by JC Penny entrance) would be a little better. After walking in, I noted there is a distinct difference between the two, because this Dino's is its own stand-alone restaurant in the mall, as opposed to a food counter in the food court. 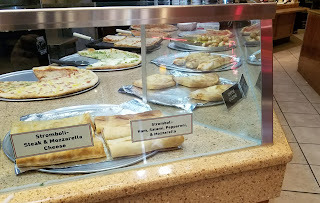 The layout was pretty typical of your mall pizzeria, long counter with glass displaying several varieties of pizza. 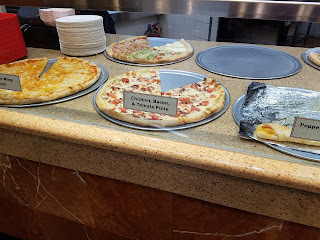 They all looked pretty decent, including the buffalo chicken pizza which came highly recommended. I passed on the buffalo because the first lady and I were on our way to dinner elsewhere and didn't want to fill up. My wife is also not a fan of ranch dressing, so splitting a slice of that of that would not have worked out! 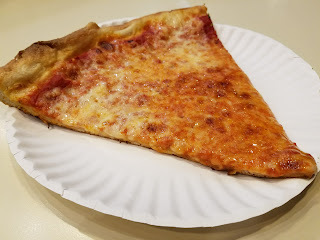 We decided to go with a plain NY style slice which looked to be at least an hour old so I specifically asked the lady to heat the slice up well because I like it nice and hot. 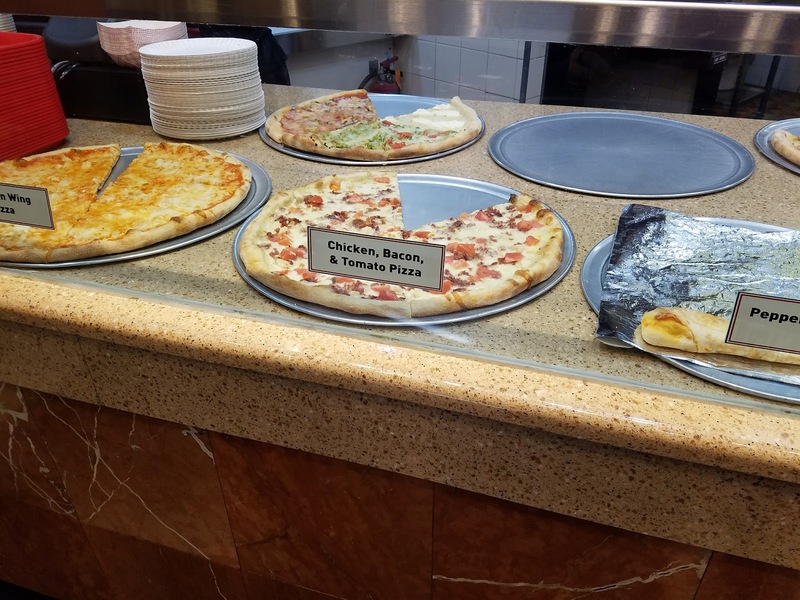 She stuck in in the oven and gave it to me within about 45 seconds, so it certainly was not hot as I requested and this is the biggest pizza foul that mall pizza commits on a regular basis. A bit frustrated, we headed to an empty booth to try this slice out. I can't describe this experience as anything but typical mall pizza. 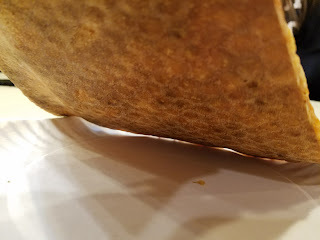 The crust was pretty good, a little above average. It wasn't crispy due to the rapid reheat, but it was tender and had a nice light bubble pattern around the edge leading me to believe there is a lot of potential for a fresh and hot slice. 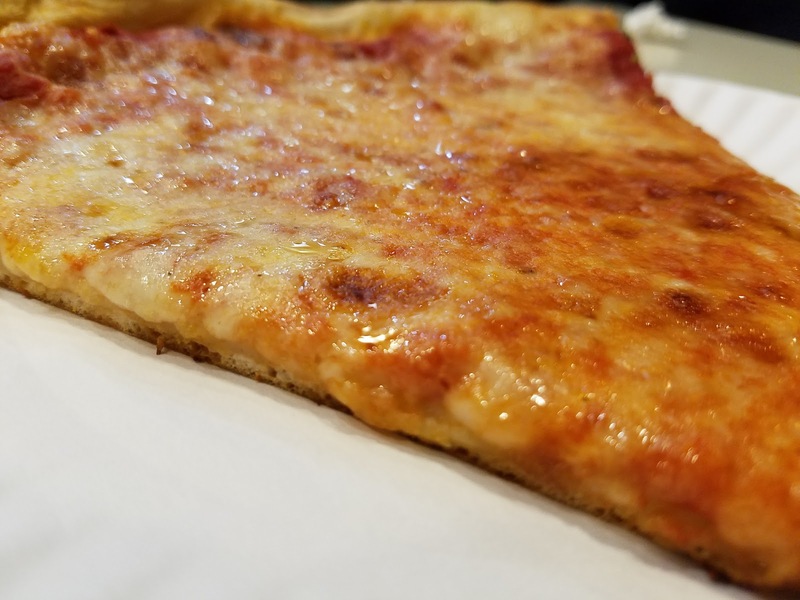 The pizza was light on the sauce, and some had been absorbed by the cheese and dough over time, so there wasn't a ton of flavor or texture to contrast or balance out the equation. The cheese was your standard mozzarella that was pretty tasty. I have to believe that given a fresher pie, or a more thorough reheat, a marginally higher rating could have been achieved. 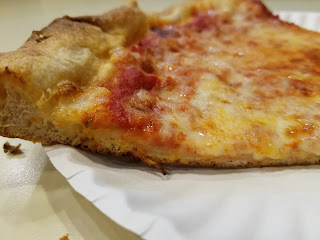 I know there is some potential here, but I have to review the slice I was served and share my experience. Overall, I thought the place was clean and the service was fast. I would agree that this is the better of the two Dino's in the Wyoming Valley Mall. This pizza would be an excellent choice for a shopper on the run that wants a quick slice. It is pretty kid friendly and inviting. I took a look at the menu which offers much more than pizza including sandwiches, salads, hoagies, and dinners. You can certainly sit down comfortably and have a full lunch or dinner here as well. 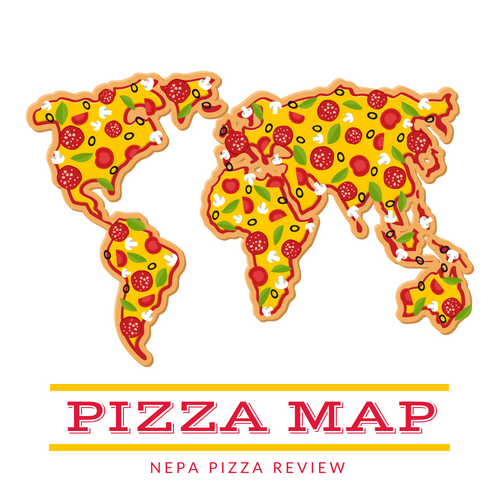 I would recommend to the NEPA Nation to give this place a try and send me some feedback in the comments below to share their experience. I, myself do plan to go back during a peak lunch or dinner time to give the pizza another shot, and I certainly want to give the buffalo chicken a try as well. 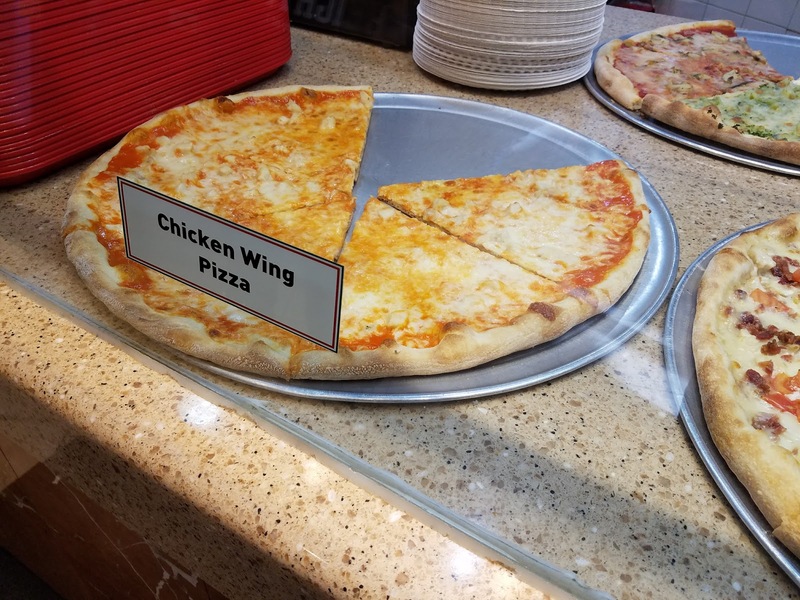 Finally, this is the type of pizza that kids and casual pizza lovers will enjoy for sure.